The 2nd stop in our trip to SXSW . . .
We thought it would be fun to boondock for one night. 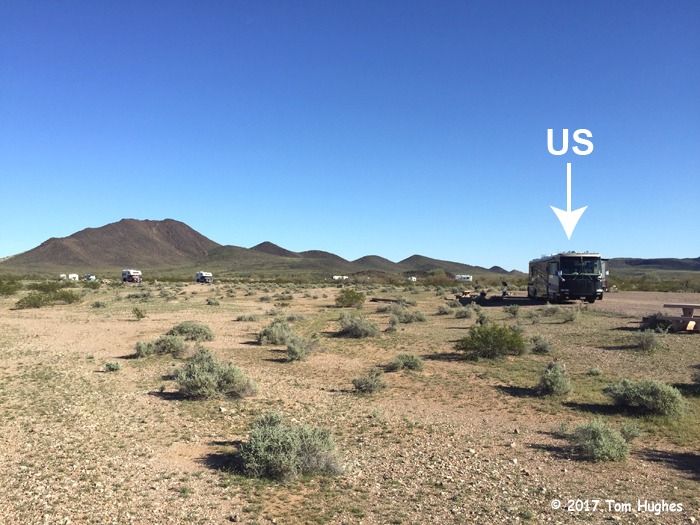 Boondocking is staying somewhere where there are no water, electric, or sewer hookups — for example, camping in a Walmart parking lot or in the middle of the desert (like Painted Rock). 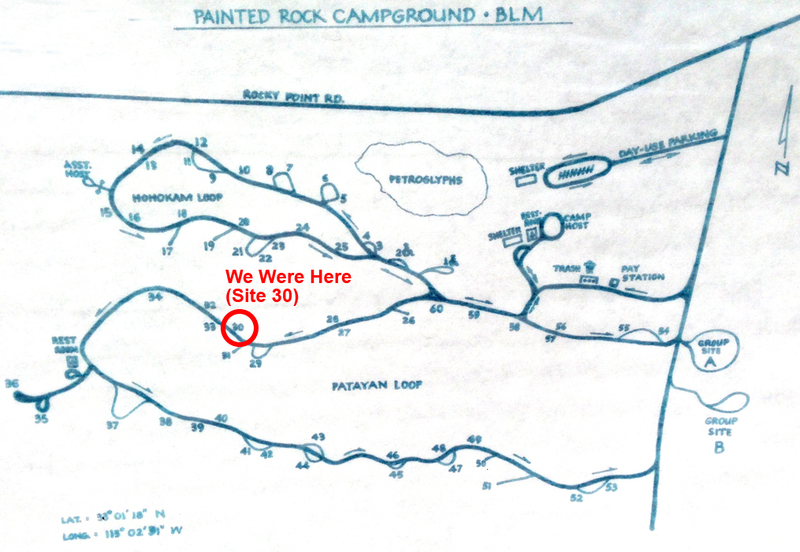 We camped in Site 30. Jan and I made sure our motorhome’s on-board water tank was full and that our holding tanks were drained. We hoped we had enough juice in our batteries. After watching about an hour of TV, we watched our battery voltage drop and drop . . . 12.4, 12.3, . . . (11.9 volts is as low as you should go). So we shut everything off, including power to our residential fridge, hoping for the best. At 3:30 AM our AGS (Auto Generator Start) system started up. When battery voltage drops too low, our motorhome’s generator fires up automatically in order to recharge the batteries. However, we turned off our generator because the park doesn’t allow running them after 8 pm. Then we went back to bed. As luck would have it, when we woke up, we were able to recharge our batteries in short order. We’d like to boondock again, but later rather than sooner. Interesting stuff Tom. 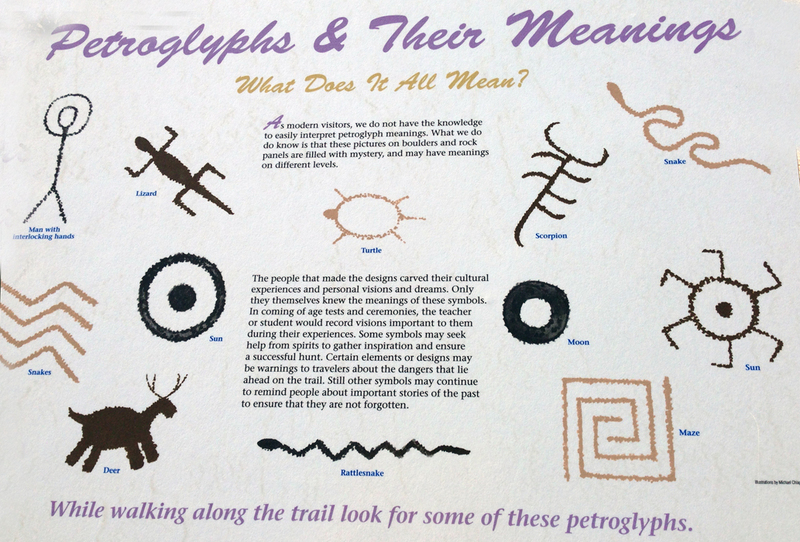 Petroglyphs – what are they saying?? Have fun guys. It’s busy in Vegas. Took an oil painting class lots of fun but Hectic. Guys, SX is busting out all over. Peruse performers, films, sessions and parties at your leisure. Listen to Austin 100 on NPR. Be sure to get SX Go app and build your schedule. Thanks for sharing all those pictures. Bet the sky view was awesome. Thanks for sharing this, we go right by there every few years …..overnight spot for sure next time,thanks. Great photos. 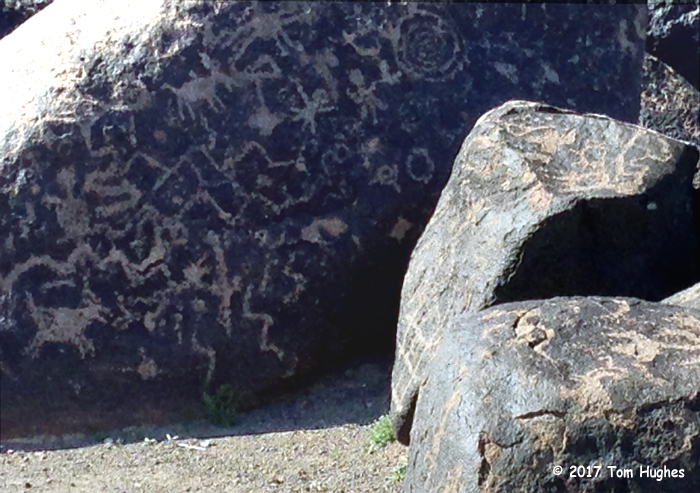 The petroglyphs are awesome. It’s interesting how close together all of the figures are; they don’t proceed in a line, as a story might. Anyway, interesting spot. Certainly worth the trip. 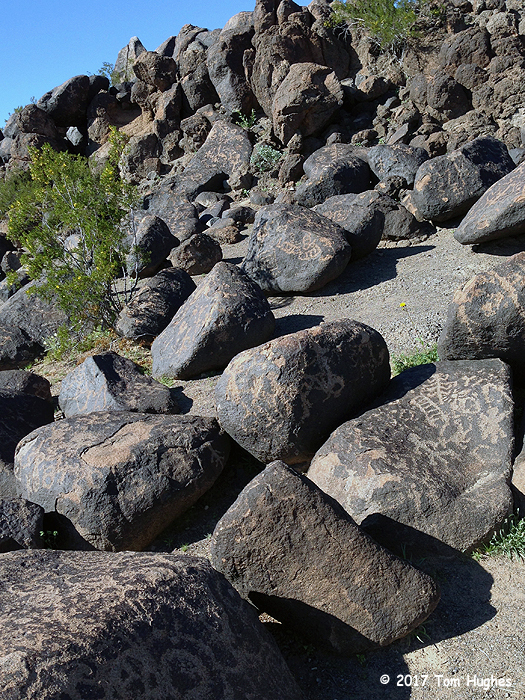 The petroglyphs were everywhere on nearly every rock and on the top, bottom, and sides. 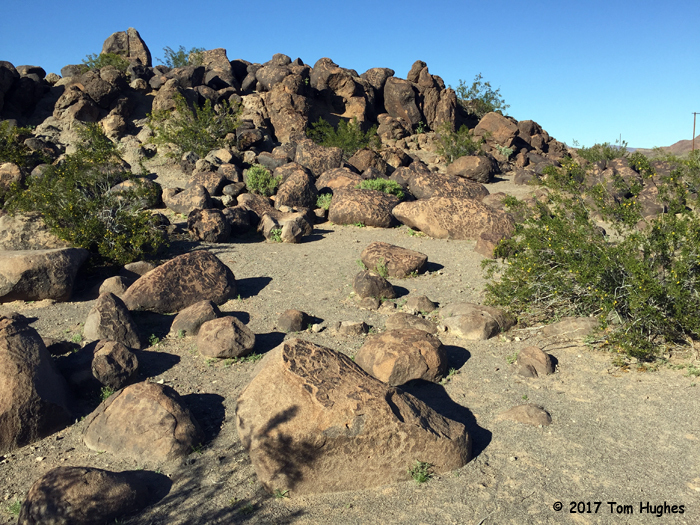 It is as if the petroglyphs were written all around the rock and then placed in this large jumble of rocks rather than being written on rocks that were already in place. It seems to be a sacred place. 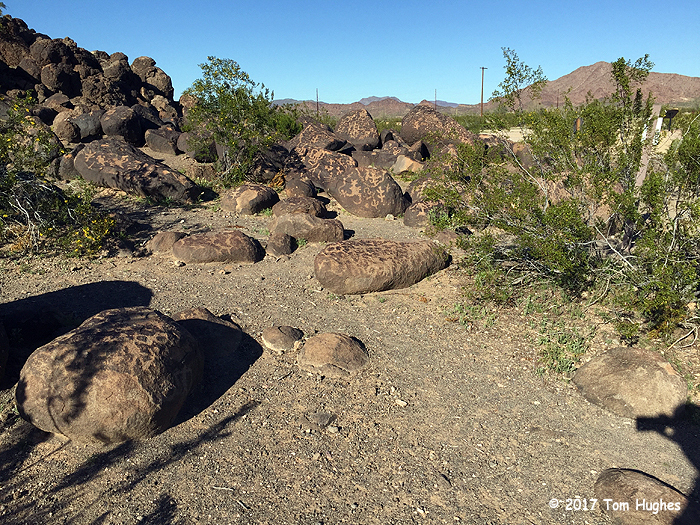 I was sorry to see that it was not being run or cared for by the descendants of the peoples who placed the glyphs on the rocks. 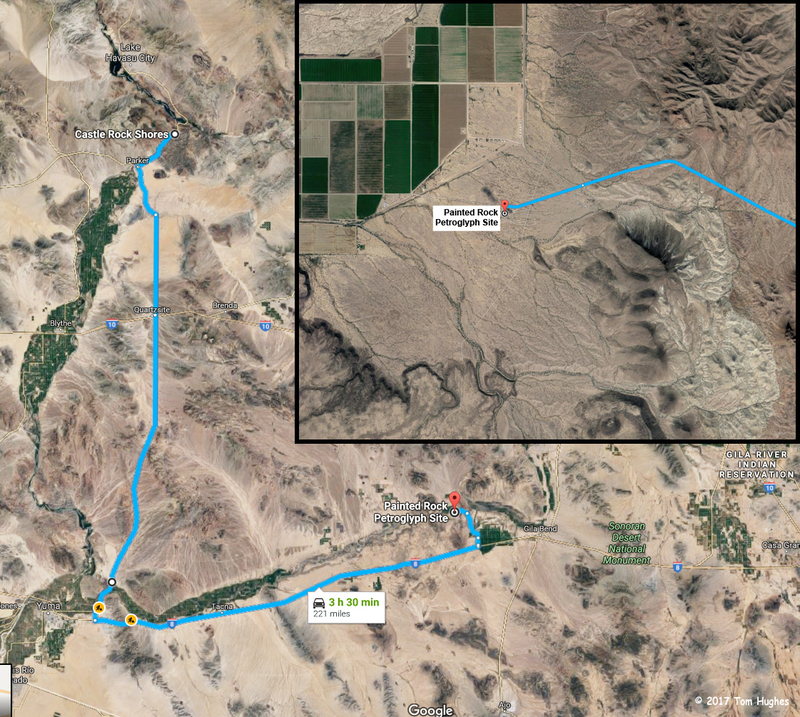 When we were at Puya Canyon Cliffs, the site was operated by the descendants.